In Atmospheric Circulation – Part One we saw how the pressure “slopes down” from the tropics to the poles creating S→N winds in the northern hemisphere. In The Coriolis Effect and Geostrophic Motion we saw that on a rotating planet winds get deflected off to the side (from the point of view of someone on the rotating planet). This means that winds flowing from the tropics to the north pole will get deflected “to the right”. 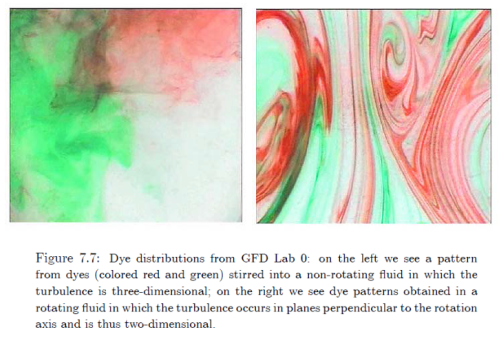 Strange things happen to fluids in rotating frames. To illustrate let’s take a look at Taylor columns. The static image is quite beautiful, but the video illustrates it better. Compare the video of the non-rotating tank with the rotating tank. Now to stretch the mind we have a rotating tank with an obstacle on the base – in this case a hockey puck. The height of the puck is small compared with the depth of the fluid. 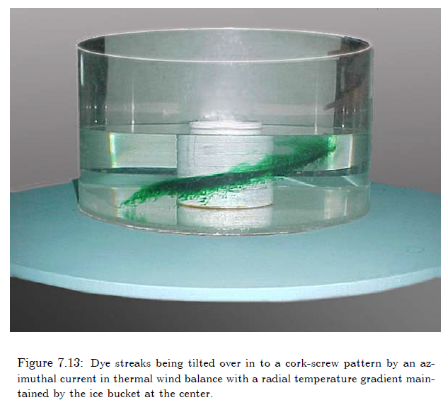 The fluid flow has come into equilibrium with the tank rotation. We slow down the rotation slightly. We sprinkle paper dots on the surface of the water. 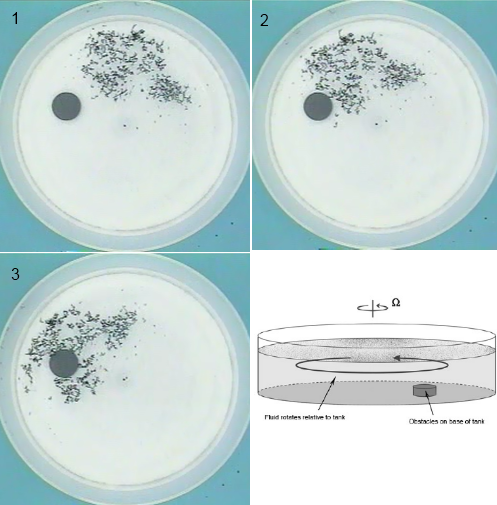 Amazingly the dots show that the surface of the fluid is acting as if the puck extended right up to the surface – the flow moves around the obstacle at the base (of course) and the flow moves “around” the obstacle at the surface. Even though the obstacle doesn’t exist at the surface! Under the first two conditions the flow is geostrophic which was covered with examples in The Coriolis Effect and Geostrophic Motion. And under the final condition, with no temperature gradient the density is uniform (only a function of pressure). Even better – take a look at the video. This experiment shows that once there is a N-S temperature gradient the E-W winds increase with altitude. So the ever increasing pressure gradient with height (due to the temperature gradient) induces a stronger geostrophic wind with height. 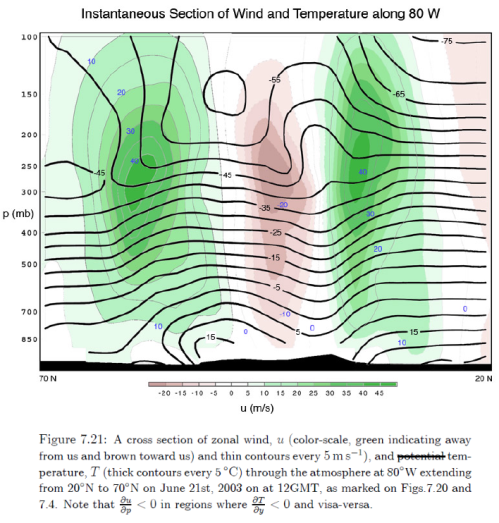 The measurement demonstrates that the change in E-W wind vs height depends on the variation in N-S temperature. 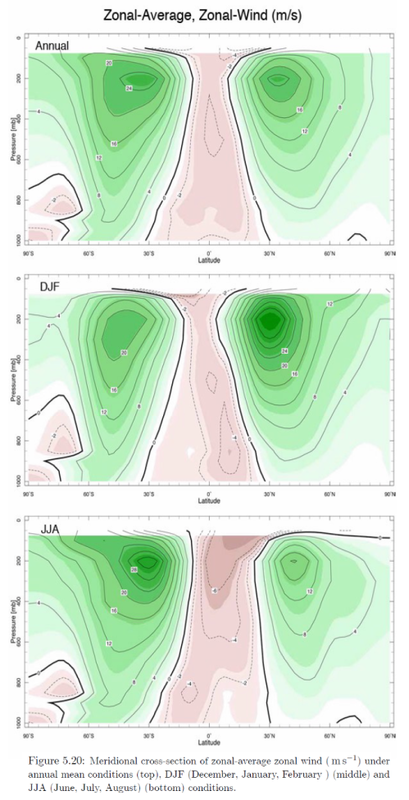 In the next article we will look at why the maximum effect in the average, the jet stream, occurs in the subtropics rather than at the poles. Check the ppt of Chapter 07. Well spotted. I updated the graphic for figure 8. On the missing molar mass, I have now clarified the equation in a comment. A possible situation and the one actually observed is that rather stable geostrophic winds persist. To have such a wind something must balance the force created by the pressure gradient of your Figure 6. The only horizontal “force” available is the Coriolis force. Your formulas represent the requirement that the “pressure force” and the Coriolis force are equal in size and have opposite directions. 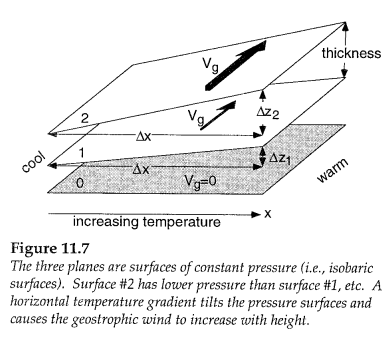 So from the equations we see that the E-W wind is proportional to the change in N-S pressure, and the N-S wind is proportional to the E-W change in pressure. It is more convenient to consider the height of a pressure surface rather than the pressure at a given height. This version of the equation doesn’t include density, ρ, and given that density varies in a compressible fluid like air this is a very helpful version of the equation. It is one reason why pressure is often preferred over height as the vertical coordinate. 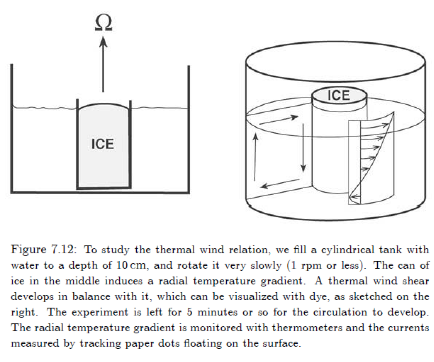 And back to the thermal wind equation – if we differentiate equation 4 with respect to height we get the equation shown in the article although the derivation takes a little time to write out. Here you have a great resource on this topic. Thanks for that – it looks like the sort of thing I have been looking for. The following sentence however is a good reminder of how much things have been changing. This is very impressive work , my friend.